I wake up too late to see the sun rising spectacle on the Gulf of Mexico, but it is still quiet with only the blue heron and pelicans and sea gulls stirring about. A lone Share the Beach sea turtle volunteer now arrives with her stethoscope to monitor the walled off clutch of turtle eggs just in front of our condominium. A second turtle volunteer in her green shirt arrives from a different direction. They are conferencing. They think tonight may be the night. I just want to sit. Something keeps me from checking my email or going over my sermon for later this morning one more time. I just wait. Something tells me to wait. There are not words to describe what soon happens A white fishing boat motors then pauses, then motors on the horizon. On either side, in front, and behind the boat are at least five or six dolphins swimming, jumping out of the water beside the boat! My instinct is to yell out to the fishermen to turn off their motor. I don’t want the dolphins to get caught in the engine. Are these dolphins being trained for some aquarium? They follow so closely. The fishermen don’t seem to be observing the dolphins. This must be old hat to them. I don’t see them throwing fish to get the dolphins to entice them to follow the boat. The boat turns around and the dolphins follow pursuing the boat until it is out of sight. It was brief but like something I had never seen before. I google “why dolphins follow boats.” This may not be an uncommon occurrence, but it was new to me. It is called bow riding when the dolphins surf in the wave created by boats and wake riding when dolphins swim along and surf in the waves created by the back of boats. Google cannot explain it but suggests the dolphins are just playing and enjoying the surf. What a novel idea. Nature is affirming our need to play. Later at church I talk to our old friend Chan, who knows all about the sea. She thinks the fishing boat probably was a shrimp trawler and after gathering the shrimp, the fishermen throw the rest of the sea’s treasure back. It becomes a feast for dolphins. 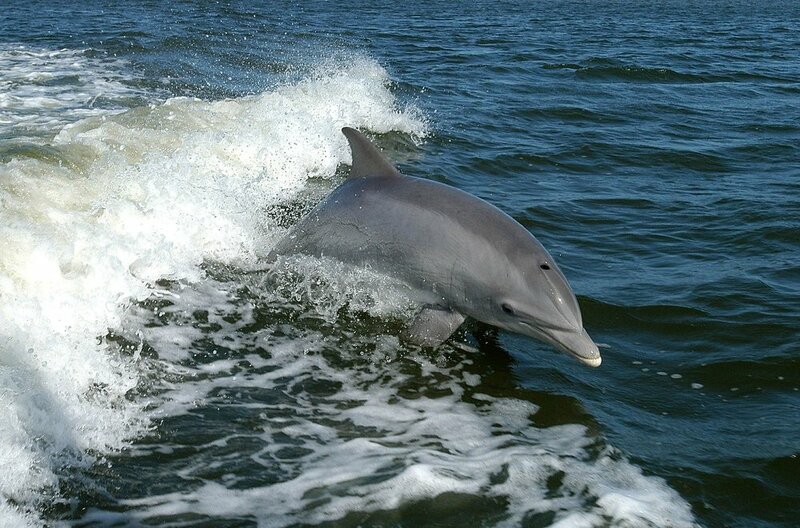 Dolphins have learned instinctively to follow these boats and wait for the catch of the day. So the dolphin show could have been related to food rather than fun, but could it be both? That evening I sit again in silence at sunset. I keep thinking about the synchronicity that I was instinctively able in the early morning by the sea to sit and wait and watch for the dolphins instead of getting caught up in the agenda for the day. Synchronicity, serendipity, the occurrence of events that appear significantly related. Now I don’t know if my need to sit and wait and watch the sea was related to the dolphin spectacle, but I am staying open, especially staying open to more sitting and waiting and watching especially by the sea.